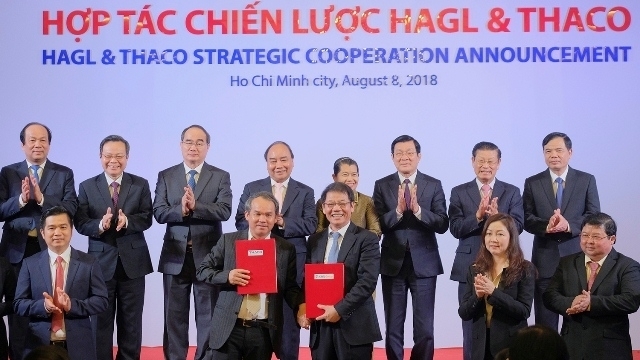 Hoang Anh Gia Lai (HAGL) Agricultural JSC and Truong Hai Automobile JSC (THACO) announced their strategic cooperation agreement in Ho Chi Minh City on the evening of August 8, under the witness of Prime Minister Nguyen Xuan Phuc. Accordingly, THACO officially signed the strategic cooperation agreement with HAGL Group to invest in its subsidiaries, HAGL Agriculture JSC (HNG) and HAGL Myanmar Centre. As committed to in the investment agreement with HNG, THACO will be responsible for the overall restructuring of the company with a total investment of approximately VND12 trillion. In addition, THACO and Dai Quang Minh Real Estate Investment JSC will be responsible for the development of Phase 2 of the HAGL Myanmar project in the country, with a total investment of US$320 million and will be completed by 2020. Speaking at the ceremony, PM Phuc reaffirmed the policy of strengthening the mechanisation, industrialisation and modernization of agriculture in Vietnam, expressing his pleasure to witness the cooperation agreement between a leading industrial enterprise and a large scale agricultural model. He praised the cooperation between the two business leaders who always have aspirations to join hands to contribute to the agricultural and industrial sectors in Vietnam, Laos and Cambodia. With their huge potential in finance, capacity and technology, the PM expressed his belief that the agreement would concretise the agricultural modernization dream of businesses in particular and the three countries’ agricultural sector in general. “Today we are promoting a more fundamental trend in which entrepreneurs with great potential directly contribute capital, technology, and governance to transform agriculture”, the senior government leader said, adding that this is also a new inspiration for domestic enterprises to innovate, merge, cooperate and develop. The PM said he hoped that the agreement would set the model for the application of advanced technology in agriculture, and also the tendency to shift investment flows in agriculture and call on big businesses to invest in agricultural development. With the cooperation agreement, PM Phuc wished to bring together the three agricultural sectors of the Indochina countries closer together to complement and resonate with each other, thus raising incomes for the people of the three nations. At the ceremony, Doan Nguyen Duc, Chairman of HAGL Board of Directors, and, Tran Ba Duong, Chairman of THACO Board of Directors, presented donations to support Lao people affected by the recent dam incident in Lao Attapeu province.